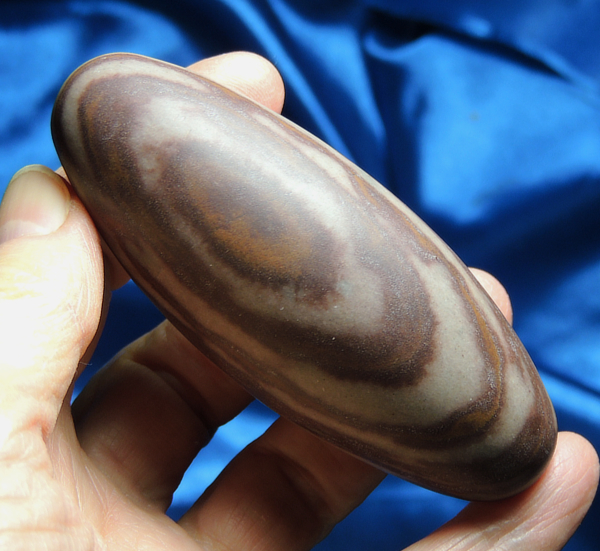 This is a beautiful 2.7 oz, Shiva Lingam, 3.4” long and 1.3” in diameter, gorgeously banded in shades of deep chocolate with a handsome russet, accented with a very soft toast. Shiva Lingams are microcrystalline quartz and are shaped by the movement of the river waters in India. They are deftly and reverently hand-polished to a soft matte finish. He is from my personal collection and sadly, our time together has come to an end … he passes with much love to his new Keeper. Shiva Lingams hold great power. They represent the joining of a man and woman in beloved expression of their love. The Shiva Lingam represents the man. The Shiva Lingam is used to help balance and energize – I love to sit with one at the end of a long, stressful day, allowing him to pull out the negative energies and substitute grounding ones. It is truly, renewal on every level!